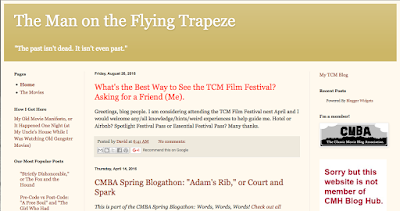 The CMBA profiles two classic movie blogs per month, on the 1st and the 15th of the month. Today we're featuring David from The Man on the FlyingTrapeze. If you remember the Spike Jones version of the song “The Man on the Flying Trapeze”, you’ll recall the mixture of admiration and humour in the lyrics. The song is kind of a reluctant love letter to a venerated trapeze artist who has stolen the songwriter’s girlfriend. 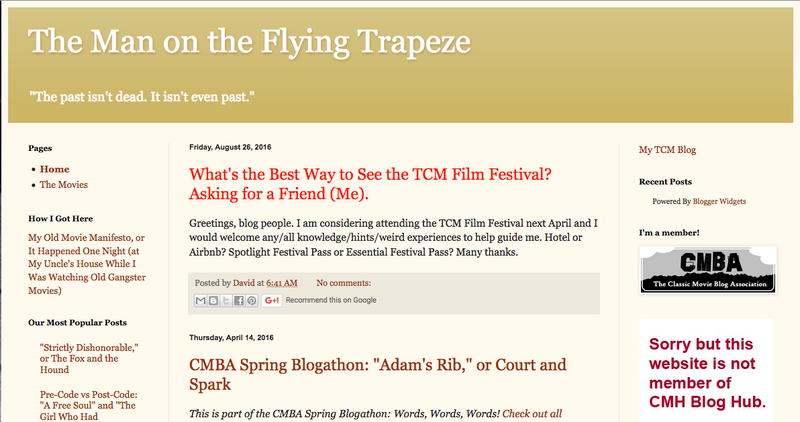 The blog, The Man on the Flying Trapeze, is an unabashed love letter to classic Hollywood film. David writes with admiration and wit about the films from the Golden Age, especially pre-code films. These he's chronicled in his "Pre-Code vs Post-Code" series. One example compares Grand Hotel to Week-End at the Waldorf. You can read this post HERE.